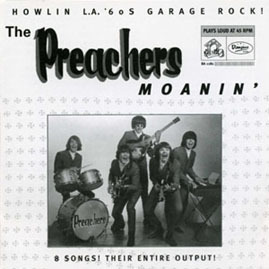 Here is the entire output of The Preachers (and their later incarnation, JOHN ENGLISH & THE LEMONDROPS). This LA area '60s punk band is best known for their scoarching version of Bo Diddley's "Who Do You Love?" which appeared on an early volume of Pebbles. The band had the total punkish sound, lyrics and image. They even wore preacher suits -- pretty brave for 1965! This pounding slab of '60s insanity finally gives justice to one of the toughest sounding garage bands to come out of Los Angeles. Click this link to watch The Preachers performing "Who Do You Love" on the Shivaree TV show in 1965!